The ship was lost. Sails and mast gone, it was caught in a current that was taking it inexorably westward, farther and farther from any lands the crew or passengers knew, deeper into the trackless World Ocean. The storm had caught them 3 days after they left the Central Sea, sailing through the straits and turning away from the mountainous rock that marked them, to follow the coast of the great southern continent. It battered and pushed them toward the setting sun, until the large reed vessel finally slipped out of the storm. Caught in the grip of a wide, strong current, the craft continued its' westward journey while its' surviving passengers recovered and rejoiced that they still lived. While the ship looked devastated, much of the reed in the walls of the deck structures had blown flat to the deck, and not overboard, like the sail and most of the mast had done. The spare sail, much food, most of the trade goods, one of the traders, and one of the crew had followed sail and mast in that calamity. The remaining crew, its' members from all along the Nile, re-tied the high inward arcs of the bow and stern, re-built a shelter from the remnants of the deck cabins, and re-wove and tightened the buoyant bundles of pithy reeds that made up the ship, using spare rope tied to the deck for just that purpose. Then they prayed. Later, they fished and set snares for seabirds. Woven watertight baskets of reeds caught enough rainwater to prevent thirst. The Persian traders, when convinced the storm was gone and the weather would be good for a while, took out a board with squares ruled upon it, set up small hand-carved figures on it, and started playing. By the time they sighted land, much, much later, two of the traders were good fishermen; and several Egyptians were learning the Persians' game. And the people of the great island on which they landed took the game as their own, tinkering with it and extending it in several ways. These games are meant as companions to Modern Shatranj, extending the ideas presented there. It is recommended that the general and alfil-type pieces be given their additional 1-step moves from Modern Shatranj, and that the dabbaba-type pieces also use a 1-step wazir move to aid in the flow and play of the variants, but this is not necessary. Adding those one-step moves does make the game easier and more comfortable to play. Because the pieces are short-range, there is no real necessity to set the sides up with the same pieces directly across the board from each other. Indeed, the earliest forms of chess often opposed king and general. Below are a few set-ups that may be used, even in combination. [Several presets are available. Click on any setup pictured below.] In Great Shatranj, played on a 10x8 board, all the pieces are set up along their respective rear ranks. Each player's second rank has 10 pawns. In Grand Shatranj, played on a 10x10 board, 8 of the 10 pieces and all the pawns are moved one rank closer to the middle, with the rook-type pieces staying in the 4 corners of the 10x10 board. Click on any setup pictured above for that preset. King (K) - The king is the standard shatranj or orthochess piece, moving 1 square to any of the adjacent 8 squares. Checkmating the opponent's king is the goal of the game. A king may neither move into nor remain in check. General (G) - The original general moved only as a ferz (F), one square diagonally. It is recommended that one of the two following versions be used. The Modern Shatranj general (G) moves as the king, one square in any direction. This piece falls midway between the knight and rook in value. The Roberto Lavieri variant MS general (S) slides one or two squares in any direction. This 'Strong General' (S) piece should be worth about a rook. Rook (R) - The rook is the standard shatranj or orthochess rook, moving any number of empty squares orthogonally. Dababba (D) - This might be the precursor piece to the rook (or it might not). The original piece, the dabaaba, jumps two squares orthogonally, passing over any piece next to it. It is restricted to one-quarter of the board. The preferred piece for these variants uses an alternate spelling to help indicate its' difference. The strong dababba adds the move of the wazir, a one-step slide, to the move of the original dabaaba (DW). It maintains its' jump over an adjacent piece. Alfil (A) - The original alfil moves in a two-square diagonal jump, leaping over any intervening piece. This original piece can only reach one-eighth of the board. It is strongly recommended that the MS alfil piece (E = Elephant) be used in these variants. This adds the move of the ferz to the original alfil (E = A+F), giving a piece that slides one square, or jumps two squares. This piece reaches half the board, and is colorbound. It maintains the original jump of the alfil over a diagonally adjacent piece. Dababba-Alfil (DA) - This piece jumps 2 squares orthogonally or diagonally. If the 'strong' versions of the 2 combined pieces are used, the piece becomes the 'Jumping General' (JG), a powerful piece (actually a DAWF) very different from the modern power pieces, the rook and queen. In value, the jumping general (JG) should be worth a bit more than a rook. Double Dababba (DD) - This piece is actually a (DW-DW) 2-step dababba-rider. It never is restricted to just the dabaaba move. It may jump or slide once; jump or slide twice; jump then slide; or slide then jump as its move. A 2-part move continues in a straight line. There are rumors that some players allow a right turn in the middle of the move, but these are just rumors. (Besides, there are no good acronyms left for "Flexible Knight".) I guess we'll settle for "XN" for Flexible Knight, aka the double dabbaba with a bend. The difference between the 2 pieces is that the DD must go straight, the XN may go straight or turn. Double Alfil (EE) - This piece, actually an (AF-AF), is the 2-step alfil rider, similar in all respects to the double dababba, including the rumored Twisted Knight (TN), which may turn in the middle of its' diagonal move. This piece and the double dababba are the only two pieces that have an intermediate-range move of up to 4 squares. Knight (N) - The knight is the standard shatranj or orthochess knight. It moves one square orthogonally, then one more square diagonally outwards. It jumps any and all pieces between its' starting and ending squares. Note that this knight move may also be considered as a one square diagonal move, followed by moving one square orthogonally outward. Knight-Dababba (ND) - This piece combines the moves of the knight and the dababba. The strong version of the piece includes the wazir move (NDW), and it is recommended that this strong version be used initially. Knight-Alfil (NA) - This piece combines the moves of the knight and the alfil. The strong version of the piece includes the ferz move (NAF or NE), and it is recommended that this strong version be used initially. Knight-Wazir (NW) - This piece combines the moves of the knight and the wazir. It moves one square orthogonally, then optionally, one square diagonally outward. It jumps any piece in its' way. 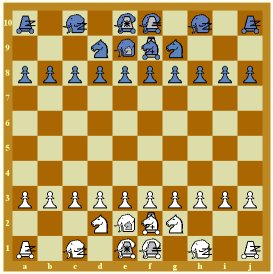 It is suggested that this piece not be used until players become a bit familiar with the game and the other pieces. Knight-Ferz (NF) - This piece combines the moves of the knight and the ferz. It can be considered to move one square diagonally, then, optionally, one square orthogonally outward. It jumps any piece in its' way. 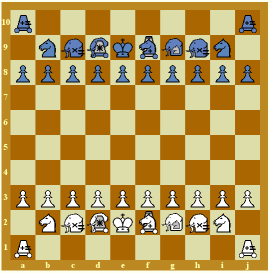 It is suggested that this piece not be used until players become a bit familiar with the game and the other pieces. Pawn (P) - The pawn is the standard shatranj pawn, exactly like the orthochess pawn, except that it cannot double-step on its' first move. The rooks, knights and elephants are set up as normal. A screen is placed across the middle of the board and the players secretly set up their 4 remaining pieces anywhere on the 4 remaining (middle) back-rank squares. If the augmented knights are used, they replace the standard knights. If the players agree beforehand, they may set up 2 rooks and the modern shatranj general, or trade in the general and one or both rooks for the Jumping General and a dababba or two, behind the screen. If they started with the augmented knights, they may trade one or both augmented knights and one or both dababbas for standard knights and rooks, on a separate agreement made before the game. Rooks may also be traded in for double-dababbas. The standard rules of historic shatranj apply. There are a number of issues and possibilities with promotion. Various options will be presented, with recommendations for beginners in each category. A1 - Promotion is on the 8th rank - recommended for Great Shatranj. A2 - Promotion is on the 9th rank - recommended for Grand Shatranj. A3 - Promotion is on 10th rank. B1 - Only pawns promote - recommended. B2 - Pawns and pieces may promote. C2 - Moderate restriction: pawns promote only to lost pieces, and no more than 1 of each type. 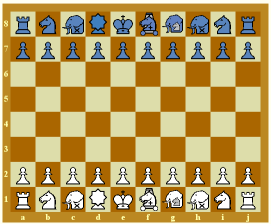 Further, if an alfil/elephant is taken, it cannot be put on the "same color" (same half of the board) as a remaining friendly alfil/elephant; and an augmented knight must be different than a remaining friendly augmented knight - recommended for Great Shatranj. C3 - Free promotion of pawns to any piece-type that starts in the game - recommended for Grand Shatranj. C4 - Promotion of pawns to any one of all the different pieces provided for these variants. Restrict to a maximum of 1 piece of each type that did not start the game. This has the potential to break a game wide open. C5 - Promotion of standard knights to augmented knights. C6 - Promotion of dababbas to rooks. C7 - Promotion of dababbas to double-dababbas (DD), which are actually (DWDW). C8 - Promotion of alfils to high priests, the NAF/NE piece. C9 - Promotion of alfils to double alfils, the EE piece. The initial game, just a single one, with a working name of "Shatranj Capablanca", grew from an email conversation between Christine Bagley-Jones and Joe Joyce, concerning ancient piece-types, while playing Modern Shatranj. Each thinks the other designed that game with minimal assistance. But the placement of the new pieces outside the bishops was annoying, and several initial set-ups were wanted. Further, the rooks were still slow and difficult to develop, since I wanted to avoid either castling or the double first step for pawns in general. Also, I was looking at more pieces, including dababbas and riders. In one sense, the rook problem was solved by replacing the rook with a dababba, workable but unsatisfactory. Then came an invitation to play a game of Christian Freeling's Grand Chess. Suddenly the 'problems' of the lack of castling in shatranj and the consequent inability to easily free up even one of the rooks, the only long-range pieces in either variant; as well as the slowness of the shatranj pawns on a large board, were solved by the geometry of Grand Chess. And, while Mr. Freeling graciously answered my request concerning the use of the name "Grand Shatranj" and the use of the Grand Chess set-up geometry, Jose Raul Capablanca died 6 years before I was born. There is no good way to get his opinion on my use of his name for a shatranj variant. So "Shatranj Capablanca" became a pair of games: Great Shatranj, a series of 10x8 variants of Shatranj, and Grand Shatranj, similar but 'stronger' variants on a10x10 board. They provide a game very different from modern chess. I'm not fully satisfied with the name "Great" Shatranj. Grand Shatranj is fine; it has an excellent, if anachronistic, pedigree in Christian Freeling's game. Great Shatranj is more problematical for me. Most of the games that were "Great" were played on a board larger than 10x8, and I feel that this board size is a little small for a "Great" game. Further, in researching the name, I found that both Ralph Betza and David Paulowich have mentioned, but not published anywhere I found, games that would be called "Great Shatranj". This makes me even more uncomfortable using the name, but I don't have a better one. So I've tried to give myself a couple of outs. The little story of an imaginary journey, in the introduction, is a slender reed on which to build an Atlantis myth, but it does give me the opportunity to use the names "Atlantean Great Shatranj", or just "Atlantean Shatranj", should that prove necessary. I also am initially posting these similar variants together under the title "Two Large Shatranj Variants", rather than separately under their own names. Should they catch on, then the games can be redone separately and if necessary, re-named. I invite comment on this, or any topic these games might raise. Thank you, Tony, for the comment and the rating. Sorry I didn't notice it when you posted it. You were partly responsible for my interest in shatranj variants, way back when. The games were fun to do and I got to "meet" Christian Freeling in the process. Fwiw, being very bad with awkward pieces, like the half-duck (HFD), and being terrified of relatively cheap but unblockable pieces capable of attacking several pieces at once, like the squirrel (NAD), I tried to design simple, obvious pieces that were easy to use and to understand. I didn't want them too powerful, but they needed to be much more capable than the original piece mix. It's nice to see some of my games being played. Thanks. Great idea to explore short range moves, in the spirit of the ancient game! Thanks for the comment, John. [And I appreciate the game. We certainly have different styles, don't we?] This fits in nicely with what George and I are talking about in the Modern Shatranj comments. And I promise to be brief. ;-) At the risk of being somewhat immodest, I rate my handful of shatranj variants as individually good to very [very] good. Others may differ. What I think is excellent is the progression from game to game, playing variations on the same theme to build a range of individual games that are each an exposition of one step in the evolution of shatranj in that parallel universe where they don't play FIDE. And you've got it, George. Just as the 'Shatranj to FIDE in 6 steps' comment in MS is a somewhat arbitrary ladder of my own devising, so too is the progression from historic Shatranj through my variants a somewhat crooked ladder that eventually leads to Chieftain and elsewhere stranger, and is no longer shatranj in any real sense, though it often uses similar pieces. Still amazing is that Modern, Great, and even Grand Shatranj were not done long ago by someone else. They were obvious games, just lying there on the ground waiting to be picked up by anybody who wandered by that spot. Apparently I was the lucky one who looked there first, but others could have. And now Maorider has popped up, another game getting initial rave reviews, as just one example of many. Makes you wonder how many good games there out there in the dark, just waiting for us to stumble over them. I am also an annoying pedant (though I didn't write that remark). I should not have said that the Atlanteans would not know what an elephant is; they probably would have known. I am playing Great Shatranj D at the moment, and enjoying it. I consider it Good, subject to possible upgrade later.